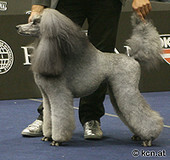 A silver Poodle is always born black and will dilute to silver color. Usually this 'clearing' needs 2 years for the smaller varieties. Standards will need more time, sometimes up to 3-4 years. Puppies have a silver face and feet at 6-7 weeks old. The slow clearing moves from the outside to the body. Face, feet are the very first and the back, head and especially the neck needs more time. It is to be pointed out, that black or dark gray grown hair will stay black/dark gray. Only the new hair on the bottom will grow constantly more diluted and finally silver. A process which needs time and silver Poodles appear during the time of 'clearing' in varied shades of black, dark gray and dark brown over the whole body. If a silver Poodle is groomed in showcoat, the jacket will be rather black/dark gray (or brown = black hair faded by sunlight) over the neck and shoulders for a long time, even if it is 4 years old. 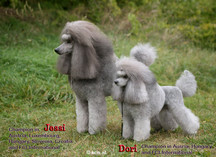 The hair grows approximately 1 cm per month, so it will take some time before the dog turned silver over the whole body. The color of a silver Standard is ready when the dog is between 3 and 4 years old and it depends on how long the coat of the jacket is. If you imagine that the color is starting to become silver on the bottom at one year of age, the jacket is 20-30 cm long at the neck and the hair grows approximately 1 cm per month - you have found the lucid explanation why the silver Poodle in showcoat still have dark hair over the shoulder/neck at an age of 3-4 years.